Our warmest and deepest condolences are extended to the family, friends and former students and colleagues of Asia-Pacific Nazarene Theological Seminary Professor emeritus and founding faculty member Dr. Ronald Ward Beech (APNTS 1983-1993), who went to be with the Lord on 23 January 2019 at the age of 92. Born 5 October 1926 in Victoria, British Columbia, Canada, the 2nd son and the 4th of the five children of Canadians Walter Beech and Viola Grace Marsh. After migrating to the USA on 16 July 1928, Ron Beech and his family lived in Lake Forest Park, a planned community north of Seattle, Washington, before relocating later to Kirkland, Washington. At the age of 10, in February 1937 Ron and his family became citizens of the USA. Raised in a godly home, his family attended Presbyterian & Methodist churches. When Ron was a young teenager, his mother and two sisters joined the Church of the Nazarene. After playing varsity football for several years, Ron graduated from Kirkland Junior High School in 1944. After graduation from high school, Ron enlisted in the US Navy at the age of 18. After basic training at Camp Bradford near Norfolk, Virginia, on 8 November 1944, Ron Beech was assigned to USS LST-646, a Tank Landing Ship that was involved in the assault and occupation of Iwo Jima (20 February to 16 March 1945). In May 1945 Ron was transferred to the USS Mellena (AKA-32), an Artemis-class attack cargo ship, that sailed for the Philippines on 13 June 1945. The Mellena reached Guiuan, Samar, 28 June. During the closing weeks of fighting in the western Pacific, she made cargo runs to Palau, the Admiralty, and the Mariana Islands, and at the cessation of hostilities, she was anchored at Iwo Jima. After transporting Seabees to Saipan, she returned to Leyte Gulf on 28 August to carry occupation troops to Japan. In the next few months, the Mellena sailed for Japan 7 September, battled typhoon seas off Honshū 18 September and arrived Okinawa a week later, before sailing for Chinese waters 29 September to support the U.S. program of assisting the Chinese Nationalists in their efforts to regain control of the Chinese mainland following the defeat of Japan. Departing Taku 11 October, she steamed via the Philippines to French Indochina where she arrived in the approaches to Hai Phong on 26 October. Steaming via Tsingtao (Qingdao) and Okinawa, she sailed with a capacity load of returning troops and arrived Portland, Oregon, 12 December. Soon after, during 1946 Ron was discharged honourably from the US Navy. By 1951 Ron enrolled at Northwest Nazarene College in Nampa, Idaho, where he met Neva Jane Templeman (born 22 May 1934 in Minot, North Dakota; died April 10, 1998 in Nampa, Idaho). While studying at NNC, Ron was a sports writer for the NNC Crusader and was the manager of KROK, the campus radio station. After graduation from NNC, where he obtained an MA in Education, Ron & Neva were married on 22 December 1953. To prepare for ordained ministry in the Church of the Nazarene as a missionary, the newlywed Beeches attended Nazarene Theological Seminary in Kansas City, Missouri. In 1958, they moved to Leavenworth, Washington to pastor the Nazarene church. 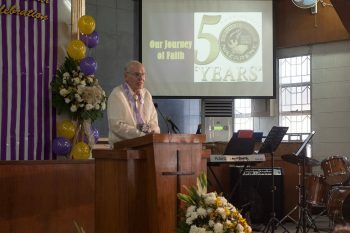 After Ron’s ordination as an elder in the Church of the Nazarene in 1962, the Beeches were appointed as Nazarene missionaries to the Philippines by the General Board. Arriving in the Philippines in January 1963, the Beeches were assigned initially to Manila for intensive Tagalog language study. 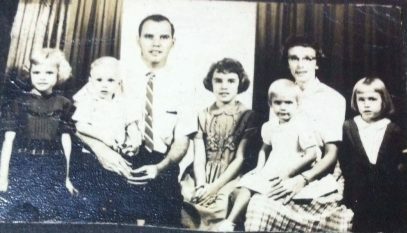 In August 1965 the Beech family relocated to Angeles City, Pampanga, where the Clark US Air Base was located and began prayer meetings in their own home. On 25 June 1965, the ground-breaking service was held at the site of the Angeles City First Church of the Nazarene, where Rev. Beech served as the pioneer pastor, before handing it over to Angelito Agbuya, under whose leadership it became the largest Nazarene church in the Philippines. During their 2nd term as missionaries in the Philippines (1966-1970), from 1967 the Beeches were assigned as teachers to Nazarene Bible College (later Luzon Nazarene Bible College and now Philippine Nazarene College) in La Trinidad, Benguet province, eventually serving there for 15 years. During a furlough, in 1970 Ron studied missions and church growth at Fuller Theological Seminary in California. Upon his return to LNBC in 1971, Rev. Beech served as the 5th president of LNBC from 1971 to 1973. As President Rev. Beech encouraged the indigenization of the faculty and handed over the presidency to Rev. Carlino Fontanilla. The Beeches continued to teach at LNBC, while Ron completed his M.Div. at the Asia Baptist Seminary in Baguio, where he later earned a Doctor of Sacred Theology in New Testament degree. About 1983 the Beeches were appointed as foundation faculty members of APNTS by founding president and Asia Regional Director Dr. Donald D. Owens, with the specific task of setting up the Kaytikling campus, writing the initial Catalogue and scheduling classes. The Beeches served with distinction at APNTS for 10 years, where Dr. Beech was at various times lecturer, academic dean, and officer-in-charge, while Mrs. Beech taught music and English. Geneva Hall is named after Mrs. Beech’s mother, Geneva Jane Russell Anderson Templeman (1898-1985). After their retirement in 1992, the Beeches served as short-term missionaries at the Nazarene Theological College in Brisbane, Australia, and also for 12 months at the South Pacific Nazarene Bible College in Apia, Samoa, along with returning together to APNTS on three separate occasions. They were members of the Nampa First Church of the Nazarene. Dr. Beech most recently visited APNTS in October 2014 with his son Barry and daughter Colleen. After being a widower for 3 years, Dr. Beech married Doris in 2001. The Beeches are survived by 5 children: Barbara York; Colleen Skinner, who served as a Nazarene global missionary with her husband Rev. Robert W. Skinner since 1990 to the Philippines, Ukraine, and Hungary, but are now missionaries in Poland; Cathy Borger; Lynette Cochran; and Barry Beech. Dr. Beech’s Celebration service will be this Sunday, 27 January 2019 at 3 P.M. in the sanctuary of the Nampa First Church of the Nazarene. The First Myanmar Southern District NYI Conference - 86 views. Nazarenes Around the World Respond to Christchurch Shootings With Love - 69 views. New Beginnings for CIC Myanmar Students - 52 views.